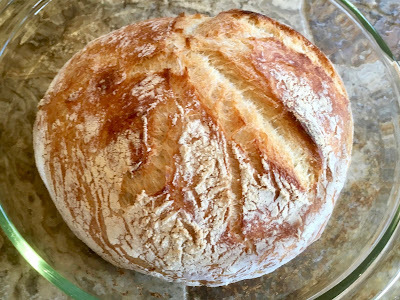 We recently got together and Rosella came bearing gifts that included a delicious loaf of crusty bread she'd baked fresh that morning. It was SO delicious we begged for the recipe. Mix up the batter the night before and bake it 12 or more hours later – so easy. Combine flour, yeast and salt in a large bowl (I use my 8 cup glass measuring cup). Add water, and stir until dough is combined and very sticky (using your fingers to mix). Cover bowl with plastic wrap. Let dough rest/rise at least 12 hours, at room temperature. The dough will be ready once it has pretty much doubled in bulk. It will look bubbly and sticky. Preheat the oven to 500°F and put a 6 to 8 quart heavy covered pot (cast iron or Pyrex) into oven as it heats. Scrape dough onto a well floured surface (use parchment paper for easy clean up). Sprinkle with a little more flour, pat it and fold it over onto itself two to three times to form a semi-round shape. Place dough, seam side down, onto floured surface and lightly dust with more flour. When oven is ready, carefully remove very hot pot from oven. Slide your hand under dough and flip it into the pot, seam side up. It will look a bit rough on top and that’s O.K. Cover with lid and bake 30 minutes. Take the lid off and bake it for an additional 10-15 minutes until nicely browned and cracked if needed (I never need to do this). Thanks for sharing, Rosella, and until next time, happy travels!